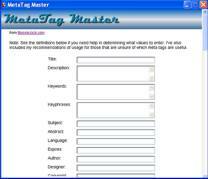 MetaTag Master's easy, fill-in-the-blanks approach makes it dirt simple for even novice webmasters to quickly create the proper meta tags needed to have your site properly indexed at search engines. Note: Meta tags are explained in the right-hand column if you don't know what they are. Do you hunt online or through old web pages to find the right syntax for meta tags for new pages? That wastes a lot of time that could be spent actually making the pages! Why go to so much trouble when MetaTag Master almost writes the meta tags for you? Actually, it really does write the meta tags for you, all you have to do is fill in the blanks with stuff you already know. You do the easy part and MetaTag Master does the stuff we all forget—it generates the code with the proper syntax! There's a lot of syntax that must be coded correctly. Remembering every little detail off the top of your head is impossible for most people. Sound familiar? Do you have second thoughts that you might be forgetting something important? Do you sometimes doubt if you've got all the syntax corrrect? Help is here! I created MetaTag Master to make it easier and quicker for me to create a proper set of meta tags. In case you didn't know it, I'm a published author of three books on web design, so if I find MetaTag Master easier and faster to use, you probably will too. As you can see, MetaTag Master does a lot! It generates the meta tag code for all the most popular and most commonly used meta tags. 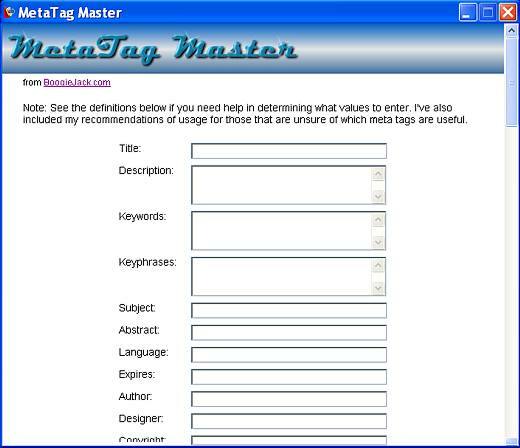 MetaTag Master is just $12.00 - a very small price to pay for something that takes all the hassle out of coding meta tags. And don't worry if you don't know what all those meta tags mean - each one is explained in plain English. Also included are my recommendations for each tag. Special Offer! Buy MetaTag Master and CSS Master together and save $5.00. See the Specials page for more about this dynamite special. Meta tags are inserted into the HEAD section of HTML pages. They provide of a number of purposes. In general, meta tags are not visible to your web site visitors. Meta tags are used to provide meta data to search engines or to provide instructions to the browser. For example, it's a meta tag that tells Microsoft's Internet Explorer not to display the image tool bar. Search engines vary in regards to which parts of the meta data each specifically uses. Some use very little, others use quite a lot, so it's wise to provide good meta data for the willing search engines. Search engines that don't use the meta data just ignore it, but those that use it will rank your site higher when your meta data is relevant to a search query. Meta data also helps establish a stronger site theme with some search engines. Even at search engines that don't use meta data in specific algorithms, keywords found in the meta tags may have a small, positive influence on the site's theme relevancy. Every little bit helps. In short, it can't hurt to include meta data, and at some search engines it does help, so take advantage of it. Add MetaTag Master to your bag of tricks today. Click here to buy MetaTag Master now, or see the Specials page to save $5.00 on MetaTag Master and CSS Master.